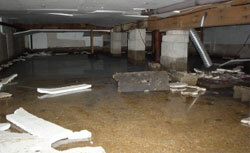 Before encapsulating your crawlspace, decide whether it requires waterproofing. While the CleanSpace® Crawlspace Encapsulation System is a great idea for keeping moisture out of your crawlspace, it should not be used to contain significant water leakage. For that, we recommend a SmartSump™ Crawlspace Drainage System. It is equipped with a 1/3-horsepower, high-quality cast-iron Zoeller sump pump with an automatic float switch. The SmartSump™ installs in a bed of clean gravel and can be fed by a drainage swale, trench system, or perforated drainage piping system. 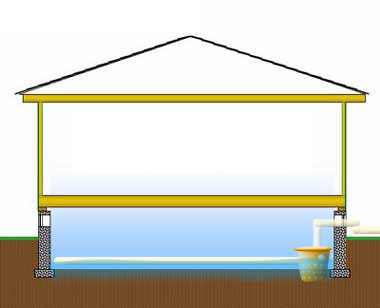 SmartSump™ sits on a special CleanPump stand to keep out silt and debris that might otherwise make its way to your pump. The pump’s pit liner has an airtight lid that makes a perfect seal with a CleanSpace® liner. Additionally, a special ball and cup design on the pump lid allows non-ground water leaks, such as a plumbing leak, to drain through the lid to the pump. If water does come from an unexpected source, the WaterWatch® Alarm will sound, letting the homeowner know there's a problem. This large crawlspace was clearly a candidate for a waterproofing system. If water in your crawlspace is a concern, you may also wish to consider adding a battery backup to your system. Our UltraSump® battery backup sump pump will run in the case of a power outage or if the primary pump is overwhelmed. The UltraSump® can drain over much as 8,000 gallons of water on a fully charged battery! If you choose not install a SmartSump™ or UltraSump® in your crawlspace, consider installing a SmartDrain™ Plumbing Leak System. This system includes a plastic drain designed to send any water that does enter the crawlspace into a drywell, keeping it out of the encapsulated area. The SmartDrain™ cover is airtight and will let water drain without allowing damp air in. An alarm installed on the top will alert you of a leak right away so you can start fixing the problem immediately.